I recently reviewed (and loved) a pair of Dot&Co organic cotton reversible trousers on my blog, and now I am happy to say that Dot&Co have offered me a fantastic prize for a giveaway… One lucky entrant will win a product of their choice from the Dot&Co range! Our range of gorgeous organic baby clothes has been designed to look great, feel fabulous and be safe for your baby’s delicate skin. At Dot & Co we understand that the best baby clothes not only look fantastic, they’re practical too so we’ve designed our babywear collection to be hard wearing, functional and cost effective. 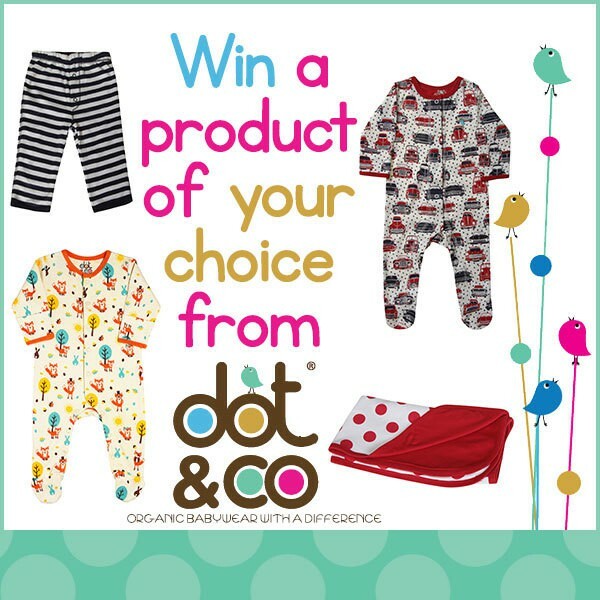 If you won, which Dot&Co product would you choose? Thank you for entering, good luck! This competition ends at midnight on 09/03/14. There will be one winner for this giveaway. Foxy and Friends Babygrow, love it! Foxy and friends baby grow! perfect for my new niece/nephew.